From atop a grassy knoll or the small pier jutting into Burrard Inlet, this is a good place to get a close look at Vancouver’s working port, with views of the colourful containers, cruise ships, heliport, and SeaBuses. Arriving from the Main Street overpass, two Chinese lion statues frame views of the peaks of the Lions; several more beautiful and moving monuments and sculptures can be found throughout the park. 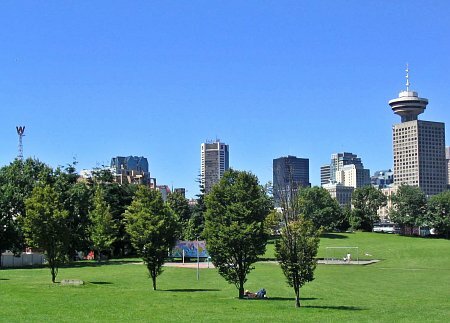 This park was opened in 1987, and was named Portside Park as suggested to the Park Board by the Vancouver Port Authority who rendered the land for park purposes through a long term lease. 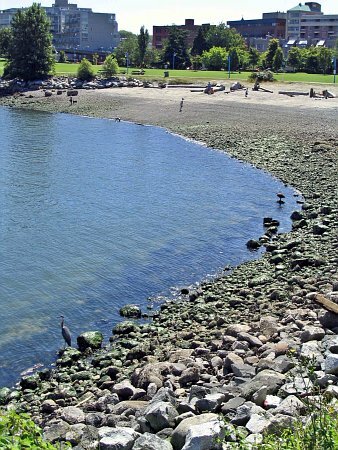 A neighbourhood park committee- Create A Real Available Beach (CRAB) – was active in supporting this greenspace and in 2004 the name was changed to CRAB Park at Portside.